Fox News opponents have often cited evidence of racism and race baiting by Fox News personalities. While this has been contested, despite the ample evidence, by Fox News’ fanbase, their unabashed hatred and violent rhetoric, such as the death threats against atheists, cannot be denied. Once again, they have come to Fox News, bearing gifts of hatred, this time toward Trayvon Martin, the 17 year killed by George Zimmerman for nothing more than walking down the street with Skittles and a bottle of iced tea, while black. The following comments are from Fox News viewers and display their affinity for hate, violence, fear mongering and blatant racism. It’s sickening, to say the least. FoxNews.com currently has a poll asking, “What Do You Think Tea Party Movement Is About?” At this moment, the leading response is “Fruitless mix of racism, conspiracy theories.” Classic! The photos with overlaid text on the front page of FoxNews.com is frequently compared to the Lolcats pictures on ICanHasCheezburger.com, but this is ridiculous… Not only is the use of ellipses not warranted, but the emphasis is beyond sensationalist. 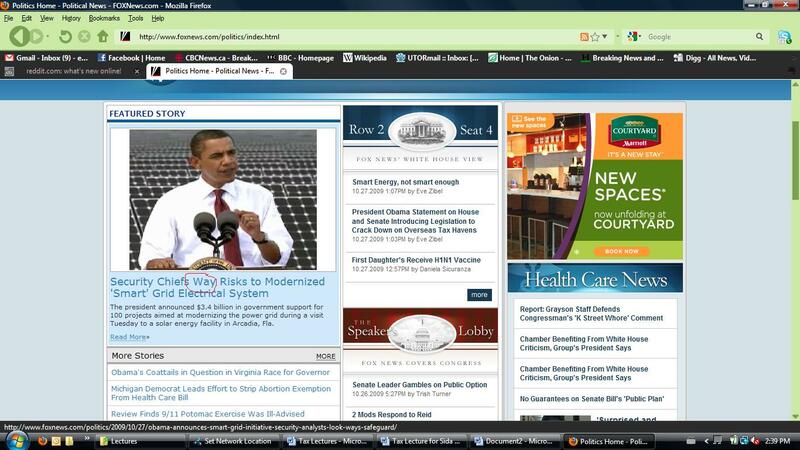 It appears the latest news item is from June, 2008. Of course, this is only one example. Here’s another: If you select “The Americas” the latest news you will find is from February, 2008! Way to stay on top of things Fox News! FoxNews.com contained a graphic stating, “GOP SWEEP,” however, it wasn’t. Their own text below the graphic even confirms that it wasn’t. This is not a mere “typo” that (to use a Palinism) “gotcha” commenters can criticize – this is an obvious and deliberate attempt to show more strength for the GOP. Their small banner used to be found at the bottom of FoxNews.com and it has been confirmed that it is no longer there. Leave it to Fox News to report pure hearsay as fact, especially if it’s regarding Fox News, or from Rush Limbaugh, or both. Supposedly, a 18 year old Michigan high school student called into Rush Limbaugh’s radio show and complained that his teacher scolded him for reading FoxNews.com. From the article, Fox News did not get a direct statement from the student, they did not find out which teacher, nor did they have a first hand account from anybody. Also important to note is that the student never made a complaint through the school, so the only record of this is a more-or-less anonymous call to Rush Limbaugh. Wow. In an article on the Fox News web site written by Glenn Beck, himself, he starts off with the fear mongering about a global Swine Flu pandemic. He asserts that the approximately 150 deaths are just the beginning, yet fails to mention that every year there are approximately 36,000 flu-related deaths in the U.S., according to the CDC. Further on, in the same article, Beck tears into the media, of which he is part, for focusing on the Swine Flu on one hand, while not paying attention to what the other hand is doing. He mentions the Air Force 1 fly over of New York and the teleprompter operator error, both of which he blames on Obama, as examples of what the media should be reporting. And there you have the hypocrisy of Glenn Beck. He begins his rant about the Swine Flu, which he later states is getting too much coverage. Keep in mind that Fox News is covering it non stop, and on other networks I’ve seen fairly even coverage. Glenn Beck is not only a danger to others, but shows that he’s a danger to himself. As if you really needed another reason not to visit their site… According to the security forum on DSLReports.com, certain advertisements on the Fox News web site may be distributing malware. And, apparently, you don’t even need to click on the ad to get infected and may contain a keylogger. 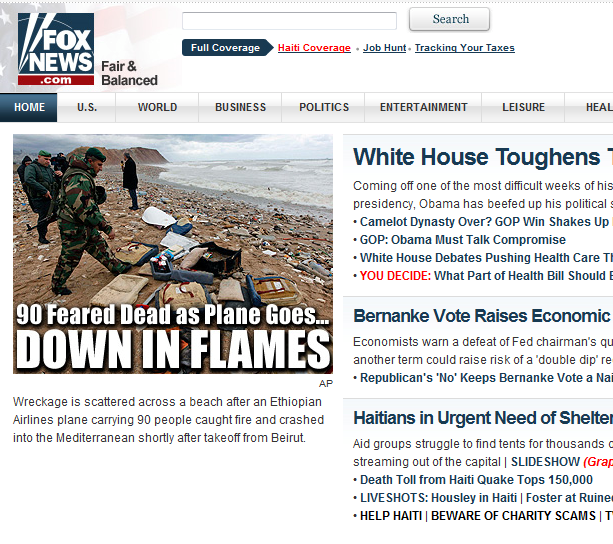 It looks like someone at Fox News isn’t keeping on top of the ad filtering, or they just don’t care.